Start with some fun on Friday, August 10 from 6:00 pm – 9:00 pm at Sholem Aquatic Center. This free event will include inflatables, a Duck Slide, DJ, roving entertainment, and more. 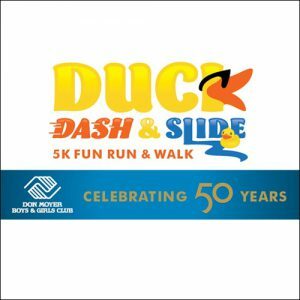 Then, come out for the main event on August 11 @ 8:00 am – 10:15 am… this year’s Duck Dash 5K Fun Run & Walk in Centennial Park… and celebrate the 50th anniversary of the Don Moyer Boys and Girls Club! This 5K will take place around Centennial Park and will start and finish at the Rotary Pavilion. All registration fees will go towards supporting the Don Moyer Boys and Girls Club so that they can have another successful 50 years as part of our community. Duck Dash T-Shirts will be provided for all racers and there will be plenty of treats at the finish! The Duck Dash will be followed by a 1-mile Duckling Dash. For more information, or to register for the Dash, visit the Champaign Park District website. © 2019 The Atkins Group. All Rights Reserved.